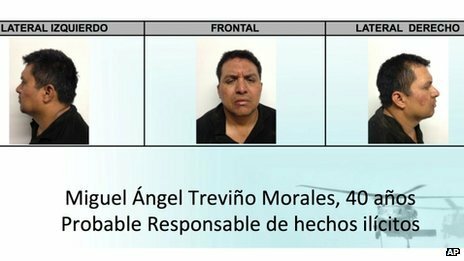 Miguel Angel Trevino Morales, one of the world’s most notorious drug-gang leaders, has been captured by Mexican marines in a raid near the US border. Miguel Angel Trevino Morales, 40, head of the Zetas cartel, was intercepted with two lieutenants in a pick-up truck near Nuevo Laredo. Mexican officials said he had eight guns and $2 million in cash. Miguel Angel Trevino Morales, infamous for his brutality, was wanted on both sides of the border for ordering massacres and running drugs on a global scale. He took control of the Zetas following the death of group founder Heriberto Lazcano in October 2012. His is the highest-profile arrest since President Enrique Pena Nieto came to office last December. Enrique Pena Nieto promised to change the policy of the previous government by tackling cartels through law enforcement on a local level rather than the capture of big-name targets. Ex-President Felipe Calderon had deployed the army across the country and pursued cartel leaders. Although the policy eliminated many senior criminal figures, it also created power vacuums that helped fuel the violence. Miguel Angel Trevino Morales Trevino Morales, known as “Zeta-40”, was captured outside Nuevo Laredo, near the US border at dawn on Monday, government spokesman Eduardo Sanchez told a news conference. “Three people in the truck were detained by ground troops, who had arrived to support the naval forces, who had carried out the detention via the helicopter. Not a single shot was fired,” he said. It is thought the authorities were acting on a tip-off. The Zetas began as the enforcement arm of the Gulf cartel, another powerful criminal gang. They were made up of defectors from an elite military unit and quickly became known for their brutality. Miguel Angel Trevino Morales was unlike most of the Zetas because he was a civilian who worked his way up through the ranks. The Zetas split from the Gulf cartel in 2010, sparking brutal turf wars across northern Mexico. By 2012, they were reputed to be the largest and most powerful cartel. But expert Alejandro Hope says the arrest is another step towards the destruction of the Zetas as a coherent organization. “There will still be people who call themselves Zetas, bands of individuals who maintain the same modus operandi,” said Alejandro Hope, a former member of Mexico’s domestic intelligence service. Analysts say Miguel Angel Trevino Morales’ younger brother, Omar, has been one of his closest lieutenants and may try to position himself as successor. The Mexican authorities fear that the arrest could lead to a period of in-fighting between different Zeta factions. Miguel Angel Trevino Morales is believed to be responsible for ordering two notorious attacks on migrants from other Latin American countries. In 2010, he allegedly ordered the torture and murder of 72 Central American migrants as punishment for their refusal to act as drugs mules. A year later, he apparently oversaw the massacre of almost 200 immigrants for similar reasons. Before he became the group’s overall leader, Miguel Angel Trevino Morales co-ordinated the gang’s important Nuevo Laredo drug corridor into the US, the region in which he was finally apprehended. He is also believed to have controlled a squad of killers who operated in the US state of Texas. The US authorities had offered $5 million reward for any information leading to Miguel Angel Trevino Morales’ capture, making him one of the world’s most-wanted drug traffickers.